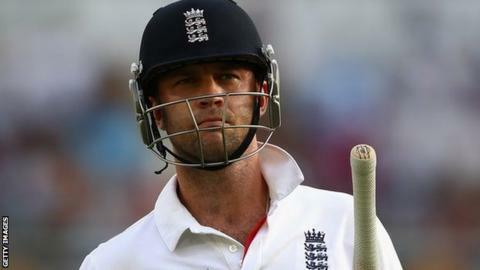 Warwickshire batsman Jonathan Trott believes he is ready to resume his international career, 10 months since his last appearance for England. The 33-year-old has addressed the stress-related condition which forced him out of last winter's Ashes tour. "The ECB and I have had our final get-together. I've been signed off by the ECB," Trott told BBC WM. "Whatever comes along with regards to selection, maybe. I'm not putting too much pressure on myself." When the latest batch of central contracts were handed out by the England and Wales Cricket Board last week, Trott, whose last international appearance came in the first Ashes Test at Brisbane last November, was not included in the list. But the Cape Town-born batsman, who played for South Africa Under-19s before qualifying to play for England, insists he has rediscovered his hunger for the game in English domestic cricket this summer. After a false start to his comeback in April, he has now made four centuries since June, two of them in the One-Day Cup, to help steer the Bears to their third Lord's final in five years. Trott will return to the home of cricket when he plays against Durham in Saturday's final, as they look to complete a seasonal limited-overs double, having already won the T20 Blast. "There's been some challenging times," he said. "Some tough times. But I've been available a while, for the last month or two, I suppose, in terms of selection and I'm enjoying my cricket. Has scored 524 first-class runs in eight County Championship matches this summer, at an average of 40.30, making two centuries and one fifty. Has scored 486 runs in eight One-Day Cup innings in the Bears' run to the final, at an average of 60.75, making two centuries and three fifties. Also played in two group matches, early on in the T20 Blast. Trott's Test average remains 46.45, having hit 3,763 runs (including nine centuries) for his adopted country, since his debut in 2009. "I've been feeling good for a while now. It's been great going back to Warwickshire. The last couple of months with Warwickshire have been fantastic." In Trott's absence, Gary Ballance has established himself in the number three position in England's Test side, but in the short-term, the right-hander is content to focus on his county career. "I'm doing my best to play as much good cricket as I have got left in me and to win stuff for the team," he added. "We've got a big final on Saturday, then another game against Durham, which is important, which we may have to win to stay second." Jonathan Trott was talking to BBC WM's Clive Eakin. Why has Jonathan Trott left the Ashes?